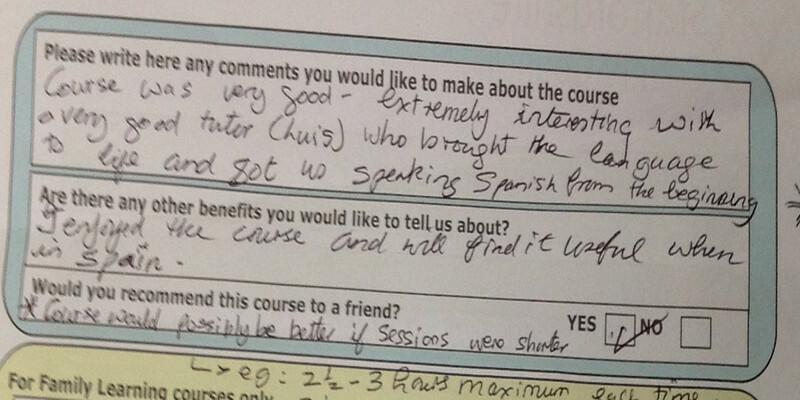 The below feedback has been provided by current or past students taking lessons with us and it is 100% genuine. Some of this feedback is hosted on other websites, Other feedback has been sent to us by the students by email. The Cambridge board released their results this morning and I thought that you might like to know that Oscar got an A*in Spanish, 95%. (He also got the A* in French too). He really enjoyed his time with you, thank you so much. Monica was great- catered to our individual needs very well. For example, with us going to Argentina, she often brought important information to the lessons regarding different pronunciations and meanings of words that would help us. We felt like Monica always put in more than the effort required during the lessons, and often stayed a little longer to ensure the lesson was finished. Most importantly, the lessons were a lot of fun and never boring, maybe due to Monica’s delivery, and it seemed as though she enjoyed them too which is even better. Both me and Aaron were busy working in the lead up to going away, so haven’t had much time to put Spanish into practice outside of lessons, however I think I can read and understand quite well and in a good position prior to going away. The service in general is as good as it needs to be- good communication and flexible. Its always a pleasure to visit Luis. Whether drilling down into the inner depths of grammar or talking about what we have done or aspire to do, time passes so quickly. A measure of enjoyment if ever there was one. My 16 year old daughter has been receiving tuition in Spanish from Luis for just over a year now. He has been an excellent teacher; calm, patient and clear. My daughter has made outstanding progress under his guidance and has recently achieved an A* in Spanish in her GCSE. She now intends to continue working with Luis at “A” level. I have absolutely no hesitation in recommending him. I really enjoyed having Luis as an A-Level Tutor, he was very friendly and was always ready to help if you were stuck on a word or grammar technique. He also had great worksheets and examples to help you understand topics. Thanks to Luis’ help, I managed to get an A at A level, and I would definitely recommend him to anyone who wants to learn Spanish. Course was very good – extremely interesting with a very good tutor (Luis) who brought the Spanish language to life and got us speaking in Spanish from the outset. Max (5 years old) and Misha (3 years old) are really enjoying your classes and talk about you all the time. Max also sings a new song each week to Misha and everyone willing to listen! Luis helped my daughter achieve a Grade A in her Spanish GCSE, following poor grades at school. Without Luis she would not have achieved this. Luis was aware of what she needed to know for her exams, and practised vocabulary using varied media. His lessons were well prepared, thorough and interesting, and he was kind and patient. I was so surprised when I saw my Spanish result because i got an A!!!! Thank you so much Luis i know if I didnt have you as a tutor i would have done much worse as i got a C in my mock. 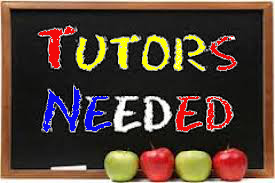 I will let anyone who i know who needs help that you are a great tutor and really helped me. I have no hesitation in recommending Luis Hernandez as a Spanish teacher for small groups or one on one tuition. I have been lucky enough to be tutored by Luis both in a group of two, and on a one-on-one basis and have found him to be an exceptional teacher. Luis was always well prepared for our lessons, reviewing the previous week’s activities and preparing the next lesson, often with supplementary materials. Luis was particularly good at utilising various relatively routine objects within our class, such as items in the kitchen, magazines and household items. This brought the learning to life and made it more relevant to daily life.I found that Luis had a fluent grasp of English, whilst still having a strong Spanish accent that allowed me to listen to the correct pronunciation in the native tongue which was very useful. Of equal merit to Luis’s teaching ability was his enthusiasm and his obvious enjoyment of teaching made the experience very pleasurable. When attending lessons after work, it can be easy for the activity to become something of a chore. However, being taught by Luis was always a pleasure and I enjoyed every lesson that I took. Luis’s personality is vibrant and energetic and his manner is warm and friendly. His approach was very professional and I always felt that I was being taught by an expert in his field. As a professional myself, I can recommend Luis whole heartedly as a suitable candidate to teach other professionals. Luis has a very suitable manner to teach anyone and has the qualities required to teach professionals in particular. Luis was always very well presented, articulate and well prepared with engaging and well considered lessons. After a long break in my learning of Spanish, I have found that Luis is really helping me to recall and progress on a ‘one-to-one’ basis of learning, whereas previously I had attended ‘Group’ learning sessions which I probably was falling behind in. 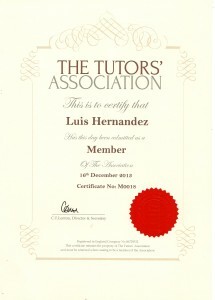 Luis, you are an excellent and patient tutor! Thanks to all your hard work and help, my daughter has just achieved and A in her recent Spanish GCSE (A* in speaking). She was failing at school due to lack of support and since her first lesson with you last October, she went from foundation paper to higher paper and re sat her 3 controlled assessments and is over he moon with her result. 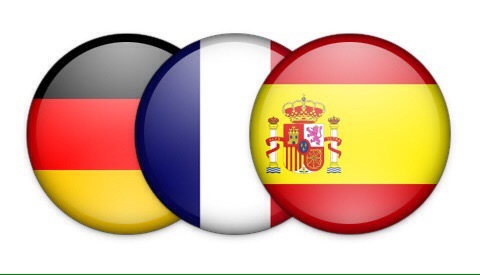 Your teaching tools are excellent and you put my daughter at ease and gave her the confidence to learn and enjoy learning Spanish ! She has decided to continue with Spanish at A level and has asked to carry on with tuition with you. For anyone considering tuition with Luis, he is excellent and we highly recommend him!! After using Rosetta Stone for a while to try to learn Spanish I felt I needed more input. At the age of 52 I have been out of learning for many years so have the re-call and speed of learning of a goldfish! If I can do this, anyone can! 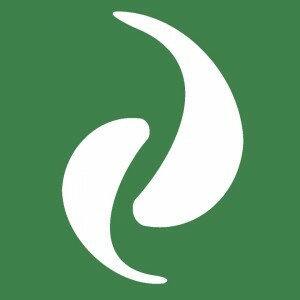 I Googled for a local Spanish Tutor and found this website. I used the chat facility which was helpful and informative. From the initial communication via text and email Luis was very helpful in answering my questions, therefore I booked in with him. Luis is a first class teacher and is very patient and professional, with a professional set up at hom too, very keen to help and I would HIGHLY recommend him to all. His rate is fair and reasonable. I look forward to progressing with his expert help and insight of all things Spanish both linguistically and culturally. Don’t think twice or look elsewhere, he is superb.